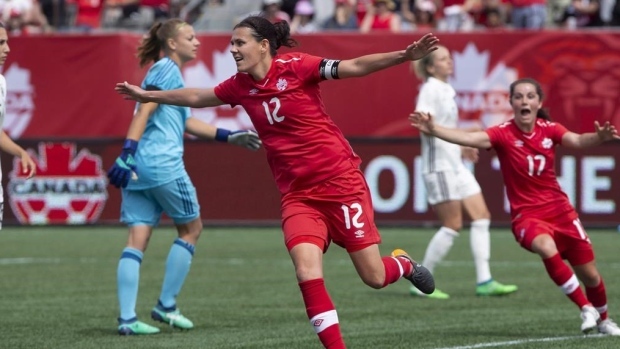 Canada Soccer announced on Tuesday that Christine Sinclair has been honoured with her 14th Canadian Player of the Year award. The Burnaby, B.C. native is Canada's all-time leader in goals (177) and appearances (274). She scored the winning goal this year that qualified Canada for the 2019 FIFA Women's World Cup in France. With her club team the Portland Thorns FC, Sinclair played all 2,160 minutes as they finished second in the league and helped the squad reach the championship final. She scored nine goals, and finished third in the league with six assists. Internationally, Sinclair, 35, led Canada in goal-scoring in 2018 for the 15th time in 19 years, scoring eight goals and two assists in 12 international matches. She collected her eighth CONCACAF medal since 2002 and sits second in goals all-time with 177, seven behind current leader Abby Wambach (184). The award is based on a vote shared by Canadian media and Canadian coaches. Kadeisha Buchanan was the runner-up, with Jessie Fleming coming in third. The men's award winner will be announced on Wednesday.